Gone are the days when the couple’s parents, or more specifically, the bride’s parents, hosted the wedding. With couples marrying much older, it is more the norm for you to make the decisions, pay the bills, and send out invitations in your own names, not those of your parents. In short, you are the hosts for your own wedding. The one thing that everyone will remember about your wedding is not what they ate, or who said what, or the details of the décor, but how you, as the hosts, made them feel. So be gracious hosts, making sure that everyone feels welcome, appreciated, and both physically and emotionally comfortable. If asking them to bring a "plus one"
Avoid writing Plus One , or and Guest on the invitation. Get the name of who they will be bringing and use it. This makes it obvious that there is a A and B list. By all means stagger the invitation process, but bring it forward a few months so those on the B list are not made painfully aware that they are second choice. Ensure that the ceremony venue is open to welcome early arrivals. By all means have signs (they are great for photos), but also have living human beings, strategically placed to welcome guests, hand out programs (if you are having those), and indicate where they should seat themselves. 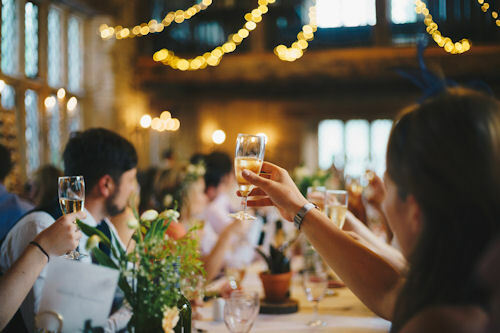 Instead of having the celebrant start the ceremony by welcoming your guests, welcome them yourselves, or, if you don’t feel up to that, have a member of each family welcome them. Allow time after the ceremony for guests to congratulate you, and to mingle a bit. For me as a celebrant there is nothing more indicative of how unwanted guests guests feel when I am asked to make an announcement requesting they hold off on congratulations until the reception because the couple and their wedding party are dashing off to have photos take and I watch the guests mill aimlessly about. Bring back the receiving line. Feel free to reinvent it, perhaps even reduce it to the two of you, but be there to welcome your guests when they arrive at the reception, rather than having them wait to welcome you! Seriously also consider both welcoming guests as they arrive at the reception. There is a whole different vibe when couples do that, and it is wonderful. It is also a good way to settle your nerves. Make sure you make time to personally speak to every single person at the wedding. (and take time to pose for a selfie with them). Make sure they know what to expect. Include information about anything out of the ordinary, and about the logistics of the day in your invitations. Make sure that you give them enough information about the venue so that they can make decisions about appropriate shoes and so on. Choose a ceremony venue that is accessible to everyone you’ve invited. And that is appropriate for the season of the year. There is nothing worse that waiting in freezing, or being seated in blazing sun. Guests who are physically uncomfortable are not in the frame of mind to immerse themselves in the emotions of your ceremony. Choose comfortable chairs – and make sure there is enough seating for everyone. Check out an outdoor ceremony venue for biting insects. Midges, mosquitoes, and biting ants will ruin the experience. Serve water or a welcoming drink when they arrive at the ceremony. Ensure that there are accessible toilets close to the ceremony site. And that the signage on toilets at the reception venue is appropriately inclusive. Tell your celebrant about your guests. Who they are, where they’ve travelled from, and how much they mean to you. Ask your celebrant to include an expression of appreciation in welcoming the guests. Request that that expression of appreciation is personalised. Don’t dash off immediately after the ceremony to have photos taken. Allow time to move amongst your guests, allowing them to congratulate them. Build in time in your reception schedule to spend time with each and every one of your guests. You might find the most practical way to do this is to go round table by table during the coffee and dessert part of the meal service. Forget the printed “thank you” cards on the tables. Thanks for gifts should be personal. You can’t beat a handwritten, personally addressed note thanking each guest for being at your wedding to support you and celebrate with you. It only needs to be a line or two, and if you do a few a day in the lead-up to the wedding, they are done in no time. Pop into an envelope, write the person’s name on it, and hey presto, you’ve also done your place cards. Make yourselves available for individual or small group photos with your guests. A DIY photo background, photo frame, or photobooth are all great ways to provide a place and a focus for this. Accept that your wedding is not just about you, the marrying couple. It is also about two families becoming one extended family. Celebrate that! Talk to your celebrant about acknowledging all of your parents in the ceremony. Give your celebrant some information about life-lessons they taught you, and things you are particularly grateful to them for. During the ceremony, speak directly to your parents. The celebrant doesn’t have to speak on your behalf! Expressions of love and gratitude spoken by you, have so much more meaning than those spoken on your behalf. If you’re going to walk down the aisle, have both parents walk you down. When you are ready to start your walk back up the aisle at the end of the wedding, go first to both sets of parents first, and then make your way back up the aisle. Make sure your parents know to follow the bridal party out down the aisle, so that they are ahead of your guests in order to ensure that they are easily included in the first few photos, and have the opportunity to be the first to congratulate you. Take time to write a longer letter, expressing love and gratitude. Mention them graciously in speeches. Recount a childhood memory that means a lot to you. Dig out all of the photos of your parents’ weddings. Choose two (one from each set of parents), copy and send to your photographer with the request to recreate those photos, and create a collage in your album. Have a fully-fledged photoshoot with each set of parents. Display their wedding photos near your guest book or your cake. For your processional, recessional, or music while you are signing and/or as part of your playlist. You might need to make a medley in order to use the choices of both sets of parents for your processional, recessional and signing. Make sure that you mention that these pieces were played at your parents’ weddings in your program, or, if you are not having a program, that your celebrant makes mention of the music when paying tribute to your parents. Word up the DJ too. Arrange for your DJ to play a song dedicated to each set of parents. (or other special family members), and to ask them to be the first dancers for that song. Join them on the dance floor after a little while. If your parents are divorced and not on amicable terms take that into account. Give them parts to play in the ceremony and/or at the reception that do not require them to interact or present as a couple. Make sure your celebrant, MC, photographer, videographer, and DJ are aware of the situation.